AVAC works to ensure that older adults are able to stay up to date on recommended vaccines. Whether due to lack of access, lack of information, or lack of income, too many older adults are prevented from receiving potentially lifesaving vaccines. For example, one out of three people will get shingles in their lifetime, but only 28 percent of Americans over age 60 have received the shingles vaccine. High out of pocket cost is a contributing factor that often directly influences a Medicare beneficiary’s decision of whether or not to get vaccinated. 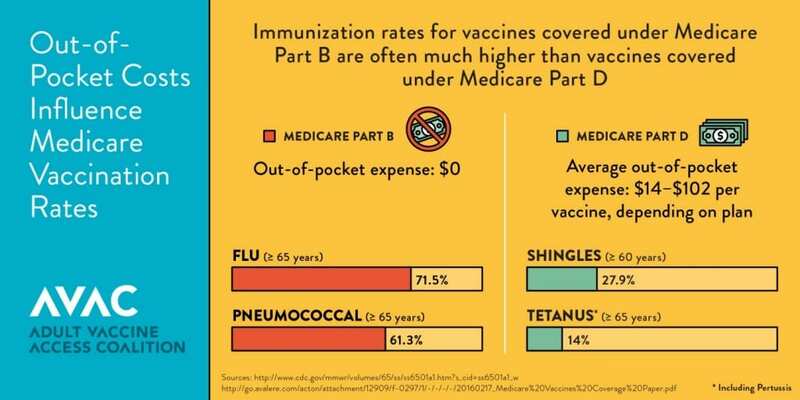 Our new infographic illustrates this connection—when seniors have to pay for a specific vaccine, immunization rates for that particular condition are often much lower compared to vaccines that they can receive for free. As President Barack Obama said in his recent proclamation to mark May 2016 as Older American’s Month, “One of the best measures of a country is how it treats its older citizens.” At AVAC we take that to heart. Our members will continue to educate about the importance of immunization for adults, work toward reducing financial barriers to vaccines for all adults and developing solutions that will strengthen and enhance adult immunization services across the health care system. Alliance for Aging Research – Recognizing older adults is one of the Alliance for Aging Research’s favorite things to do. In fact, throughout the year they will be doing a whole series of stories about older adults, including a champion swimmer, a woman who encourages you to embrace life no matter what age you are, and more. Gerontological Society of America – All throughout May, GSA has been actively promoting Older Americans Month on Twitter to share information and materials about a wide-range of issues affecting American Seniors. National Council on Aging – NCOA developed a campaign called, “Flu + You” to raise awareness about the importance for older Americans to receive the flu vaccine. NCOA reminds us about flu preventions and vaccine options. National Foundation for Infectious Diseases Nearly 1 in 3 people will get shingles in their lifetime. Fortunately, there is a safe and effective vaccine that can reduce your chances of getting shingles. Take the National Foundation for Infectious Diseases’ quick quiz to find out if the shingles vaccine is right for you or your loved one.